The Contemporary Research QIP-SDI 2 has two SDI inputs with dual encoders that process two MPEG2 or H.264 video streams, each supported by a hardware scaler that can accept and format virtually all video between 1080p and 480i in NTSC, VGA, and PAL standards. Audio can be embedded, or fed separately to digital SPDIF or analog stereo inputs. 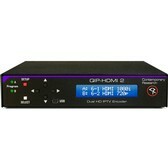 Two NTSC inputs support composite video or video with closed captioning data. The QIP-SDI is fully convergent and able to output two independent single-program IPTV streams through the GigE Ethernet port. The QIP-SDI 2 is easy to set up and monitor via the web or front panel buttons, as well as updating the firmware to have the latest features. Up to 2 units can be installed in 1 rack space, mixing other QIP encoders gives you the ability to handle 4 programs per rack space. The encoder creates up to two high-definition SPST Unicast or IPTV streams, encoded as H.264 or MPEG2. It can convert stereo and PCM to stereo AAC or MP12, passes through or AC-3 and AAC. The dual hardware scalers accept up to 1080p 3G video, including 60/30 Hz, and PAL formats, and can deliver programs at a set resolution. Sets up with front-panel buttons and easy to use menus, including inputs, encoding, channel, and RF options.